Tonight, Russell Westbrook scored 12 points, grabbed 13 rebounds, and handed out 13 assists in a rout of the listless Milwaukee Bucks. The 13 rebounds that Westbrook grabbed give him 822 for the season through 77 games. Westbrook is already well over the 820 points he’d need to average double-digit scoring this year, so he’s guaranteed to finish with at least a double-double, even if he plays his team’s remaining five games and stays out of the paint. Westbrook also had his 41st triple-double of the season tonight, tying Oscar Robertson’s record. He was highly efficient, finishing up in 27 minutes and recording the record-tying rebound and assist on the same play. The Thunder currently have five games remaining. Westbrook is sitting pretty at 804 assists, which means that he only needs to average 3.2 assists to guarantee himself a triple-double average. 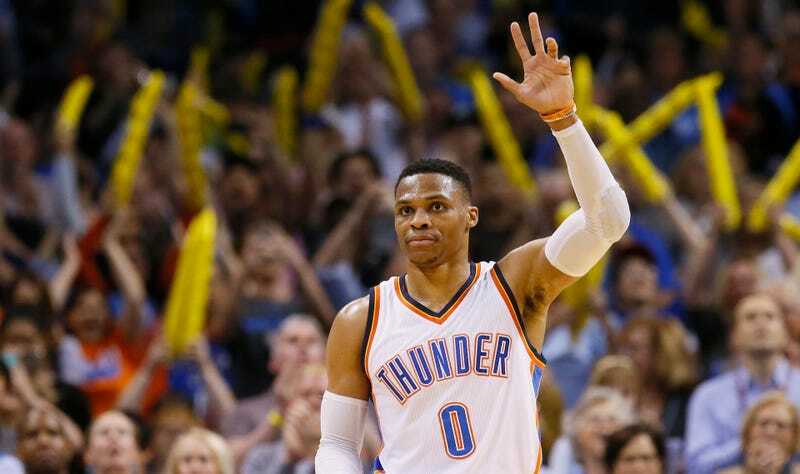 It will almost certainly take a motivated Westbrook fewer than five games to get there.